Pavi's Platter: Masala vadas (No deep fry) ! Continuing the appe pan fever, i tried making the famous south indian snack masala vada in appe pan with just 3 - 4 tbsp of oil. Can you believe it turned out awesome that tasted equally good like deep fried ones. But it needs lot of patience to make then in appe pan as you got to cook them in low flame slowly rotating them evenly so that the center part is cooked well and the outer is browned evenly and become crispy. How wonderful it is to enjoy them guilt free with a cup of tea !I am in love with the appe pan for the fact that it gives me the pleasure of eating the food I love with less calories and very tasty. 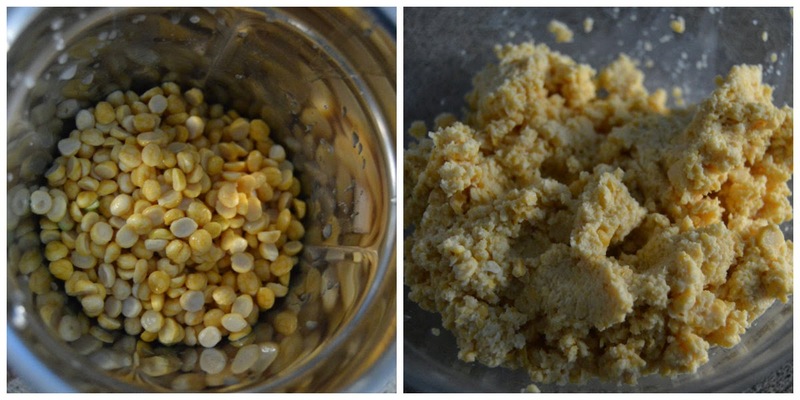 Wash well and soak the channa dal for 3 -4 hours. Then grind them coarsely as shown in the pic. It is absolutely ok if one or two dal particles are whole and not ground properly. Add the chopped onions, green chillis, hing, fennel and required salt to the ground dal. Mix well to form a nice mixture. Add some fresh coriander leaves and also torn curry leaves(optional). Pour a drop of oil in each of the appe holes and place the rolled balls carefully. They tend to break when they are uncooked. Keep the flame in low - med and let the vadas cook slowly. Keep rotating them (with two spoons) so that they are cooked evenly. Its little tricky as the center part needs proper cooking. If flame is high then it will become quickly brown outside but the center will be raw. If you are going to deep fry in oil, you can take bigger size ball and then slightly press them to make vada shape and then drop in oil. It took around 10 minutes for me to cook one batch of vadas. Slowly with patience I rolled them carefully adding a drop of oil now and then to cook properly and also to make the outer crispy. Try this out and enjoy it with a cup of tea !